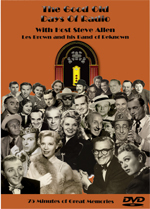 THE GOOD OLD DAYS OF RADIO Is a 75-minute 1976 TV show hosted by Steve Allen devoted entirely to RADIO, using film footage, photographs, period-re-creations and in person appearances by such radio personalities as Eddie Anderson, Gene Autry, Bergen and McCarthy, Mel Blanc, Ken Carpenter, Dennis Day, Bill Hay, Jim Jordan, Barbara Luddy, Olan Soule, Ezra Stone, Les Tremayne, Lurene Tuttle, Harry Von Zell, Lawrence Welk, Don Wilson and many others. Taped at the Century Plaza Hotel in Beverly Hills, California. A TV show that radio fans will love!